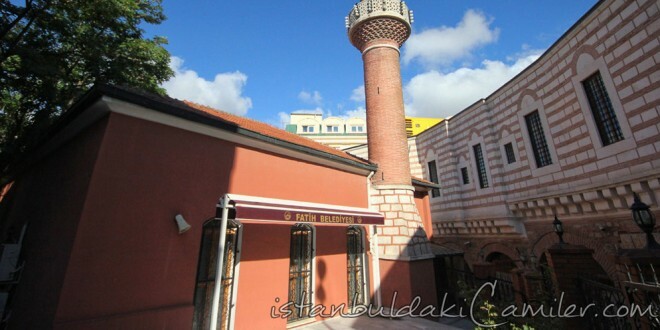 The mosque, which was originally built for Sekbanbasi Yakup Aga, -one of the commanders of Fatih Sultan Mehmet period, got its final shape in the 19th century. It is a mosque made of Stones and bricks with a wooden roof which is stanchioned with four wooden pillars. Mahfil is situated all along the last congregation section. Hamami Halil Aga had its copper-coned minbar put. Both the minbar and the rostrum are plain and simple. As for embellishment in the Harim section, there is only the large-leafed central ornamentation on the ceiling where only the middle chandelier is hanged. Its brick minaret carries the features of early Ottoman architecture.